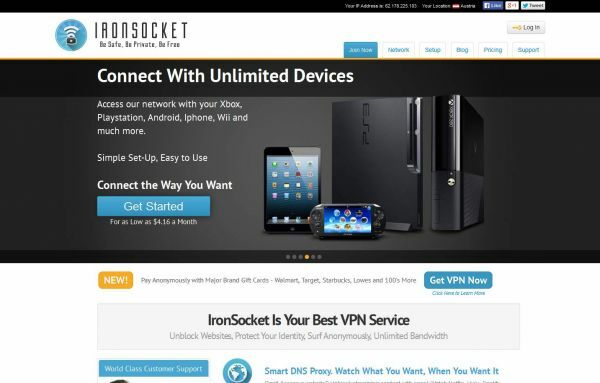 IronSocket is a Virtual Private Network service, which was founded in 2005 and originally went by the name HideMyNet. Based out of Hong Kong, it provides customers with a number of security and privacy solutions, including encryption and IP address masking, as well as the means of working around geographic restrictions. Subscription to IronSocket starts at $6.99 per month, although discount prices are available with long-term commitment. Users have access to servers in more than 35 countries and the product is compatible with a wide range of operating systems, including Windows, Mac OS, Linux, Android and iOS. For new customers, IronSocket comes with a conditional money back guarantee, which covers the first seven days of a subscription to the service. This guarantee allows users who are not entirely satisfied with the service to request a full refund and these refund requests can be made by contacting the customer service team. Users are able to ask for their money back if they experience technical difficulties, or if they are otherwise unhappy with the service they have paid for. However, it is not a comprehensive ’no questions asked‘ policy and the company behind IronSocket reserve the right to refuse requests if they do not meet certain conditions. The seven day window for the money back offer begins from the time a subscription is purchased, regardless of when the customer actually begins to use the service. In order to be eligible for a refund, customers have to have already been charged for their usage and must have paid via credit card or PayPal. Refund requests will be processed and either approved or refused within 24 hours. However, it may take up to 30 days for the money to reach the customer again, depending upon their chosen payment method. Unfortunately, the money back guarantee is not available to any users who paid for IronSocket with either BitCoin or gift cards. With ironsocket.com you are able to connect to many different countries and gain access to a wide range of IP adresses. Their servers are located in Mexico, Netherlands, Panama, Philippines, Iceland, Ukraine, Brazil, Russia, Luxembourg, Japan, Spain, New Zealand, Singapore, Denmark, Canada, USA, Romania, Argentina, Hong Kong, Saudi Arabia, France, England, Ireland, Switzerland, Sweden, Germany, Thailand, Malaysia, Norway, Italy, Taiwan, Egypt, Cyprus, Indonesia and Australia.